The Giant’s Causeway located in Antrim on the coast of Northern Ireland is one of the most beautiful places in the world. It is considered as a World Heritage site and a national nature reserve. This causeway is made up of polygonal layered basalt columns with flat peaks that form stairs towards the bottom of the cliff disappearing into the ocean. The sides of the cliffs are mostly hexagon in shape with a few being octagonal. Geologists have proven that the Giant’s Causeway was formed as a result of volcanic activities in the earth’s surface which led to the creation of large lava plateaus from molten basalt a million years ago. It is perceived that the cliffs were formed as the lava cooled. This cooling led to contraction on the surface of the plateau causing massive cracks that sunk in and left standing pillar like columns of basalt rock. 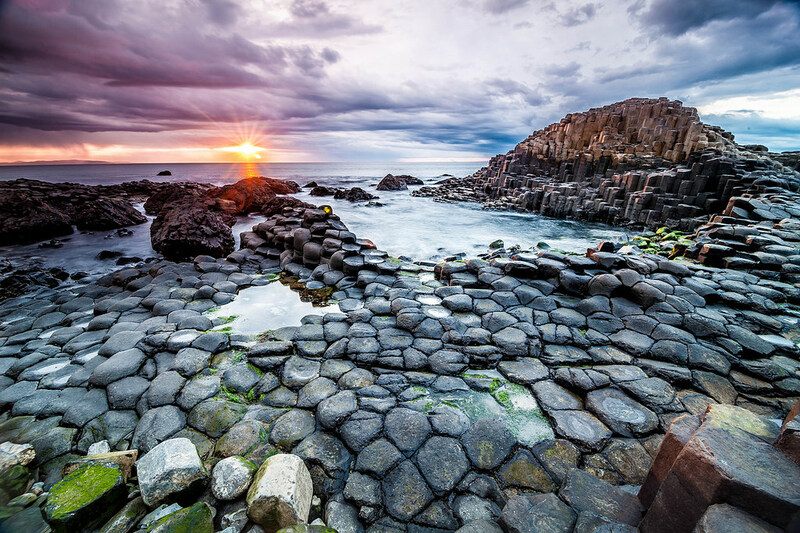 According to a myth told by natives, the causeway was created by a giant called Fionn McCool who carved it from the coastal shore rocks. The myth elaborates that the giant built the causeway to mark a battle ground where he would face his opponent Benandonner. Like many tales, the end of this story is not very clear, some people argue that Fionn won while others are for Benandonner. This tourist destination site has been visited for over three hundred years ever since the famous painter Susana Drury made a water coloured painting of it in 1738. In addition to the extremely unique rock formations, this site is popularly known for its various bird species. Several sea birds can be watched at these coastal cliffs among them being Razrobill and Fulmar as well as a variety of plant species which are rare in most parts of the world. Its seashores, marshes and grasslands are home to an unidentifiable number of sea creatures, birds and plants. The place offers a marvellous tourist destination site for all those who love nature and its ecosystem including geologists and geographers. For those of you who would love to have a tour of the Giant’s Causeway, here is a description of the route and features to seek. Assuming you are at the visitor’s centre, follow a tar road that transforms into a footpath until you reach a place known as Windy Gap (a region that is open towards the ocean where one can feel the full effect of Atlantic winds). Windy Gap is a local name given by the native inhabitants of the area. Keep moving further along the tar road and you will eventually come across the first batch of basalt column rock cliffs. Alternatively, those who do not feel like walking can hire the tourist shuttle services offered by the reserve’s management. The Giant’s Causeway is comprised of a trinity of rock cliff formation features. The first being a group of little hexagonal steps, then the honeycomb or middle causeway which includes marvellous hexagonal features and lastly, the grand causeway marked by features such as the Giant’s gate, Wishing chair and Wishing well. Beyond the causeway lies Port Noffer famously known as the bay of giants. This region has a totally different maritime vegetation and experience rather unique maritime climates with sea asters and yellow iris being common plants in the area. Past Port Noffer is the great Giant Boot and Giant Organ Church (is a large basalt column that look like organ pipe). This name was given to the place by the natives owing to the shape and appearance of the feature. The most fascinating area is the amphitheatre which is located after the organ. The amphitheatre comprises of a viewing platform where one can see the undisturbed solidified volcanic lava flows formed millions of years ago. This headland has dynamic cliffs and rock falls. However, the trail ends at this point because of the danger posed by the instability of these rock cliffs. On your way back for more adventure follow the Shepherd’s path. This path consists of a series of steps that will lead to the North Antrim cliff before you eventually arrive at the visitors centre.